This morning I awoke to a notice that Justin Rohrman, my fellow writer on this blog, had posted a piece trying to explain where startup founders come from. Justin’s not “wrong”, in as far these things can be right and wrong – but as as a former worker at Socialtext, a once-silicon valley darling funded by DFJ, I thought my experiences might add a little flavor to the piece. So here goes – Matt thoughts on where founders come from, and what that might mean for me, you, and society. To start a business you really need just two things: Time and Money. In some cases today, you don’t need significant money – companies can rent servers from Amazon to code up the seed of the idea. Still, at some point, “real companies” start to get real bills to pay, often before they are profitable. Even with the no money plan, you still need time — and most people are not willing to give up 7PM-11PM every night, plus six hours on a Saturday, to first develop the skills then build the seedling that might go nowhere. The founders I saw mostly finished a four-year college degree at an Elite university. In my experience, the real challenge at the Elite schools was getting in and paying for the degree. 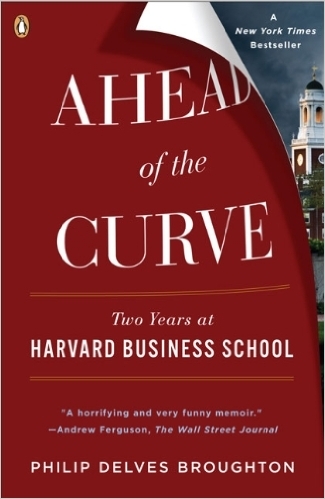 As Philip Broughton documents in his book Ahead of the Curve, Harvard Business School was willing to throw impressive amounts of help to make sure they graduated – once they got in. The sheer brainpower required to get in to the school, plus commitment to career implied, would be enough to save the “brand” of the school for decades to come. But then people graduate, and either have a great deal of debt (Average MBA debt at Cornell: one hundred and seventeen thousand dollars) or they don’t. The students with debt need to go get a job, and get one now. A few people can go on to get a doctorate in business administration and start teaching careers, perhaps deferring the debt and taking on more. Then there are those who graduate without debt, who now have a combination of time and a bit of money. Probably enough to go to graduate school and get that next advanced degree … or not. For a lot less than the price of a year at law school, the aspiring leader could spend a year in Silicon Valley, perhaps with a few roommates, either hacking together a site or recruiting hackers to create it while attempting to raise venture capital money. That is exactly what Mark Zuckerberg did in 2004, when he moved to Palo Alto for the summer … and never came back. When you look at the founders of Facebook, IMVU, PlentyOfFish, Airbnb, and so on, you tend to see the same things: Harvard, Princeton, and Yale. My argument today is that correlation is not causation. It’s not that these schools produce amazing people who can do amazing things — or at least, the case is not yet proven. Instead, it is that the people who attend these kinds of schools have the time, money, and support networks to make this type of thing possible. One nice to have: Add the kind of support networks where a failed year in Silicon Valley with nothing to show for is just fine. For example, the right person could reframe the lost year as ‘experience’, then use it and the elite degree to get a product management job at late-stage silicon valley company. The combination of upside with low risk makes that sort of move very attractive, doesn’t it? After making the software that would eventually become Yahoo Store and selling his stake in a total sale worth $49 million, Paul Graham went on to found Y-Combinator in 2005. Y-Combinator seeks to level the playing field, by providing enough seed money for a founding pair to spend a summer and fall in Silicon Valley (currently up to $120K), in trade for six percent of a company that might or might not exist at the end of the summer. Anyone can apply to these, but the company tries to build a pair of founders that have both the technical and social skills to build a beta-level product themselves, without hiring help. The goal of the beta is to attract the next round of investments, likely in the millions or tens of millions. This levels the playing field … a little. Now any pair with a CS degree from a medium-quality school and a lot of ambition can get into Y-combinator. Of course these are all mostly privileged white guys at a very specific place in their lives. What’s So Magic About Silicon Valley? It’s fair that a pair of people living in Silicon Valley, without nephews’ birthdays to go to, focused on code and surrounded by a business support network, can do amazingly well. Contrast that to the 30-something with two kids, a mortgage, and a lawn that needs to be mowed, and you begin to understand the why of the system. Changing it is going to be a lot of work. Instead of complaining about the privilege, I am interested in studying it, trying to replicate it more locally. At the end of his piece, Justin implies a model of starting with consulting, then build-a-product-in-your-spare-time. In order to really succeed at that model, you want to get enough people working as contractors to generate free time during the day — which is exactly what DornerWorks, in my neck of the woods, seems to be doing. It seems like a reasonable model. You’d better believe we have more to talk about. Interested to see where you go with this, Matt. I learned a long time ago to keep privilege in mind when considering why some people succeed and others don't. Once you start to look for those patterns, you find them everywhere. I say this as someone who has certainly benefited from family support over the years. Your post is effective to new business holder.can you tell me how can i start share business with internet.